In the Comox Valley, visit this site the I-Hos Gallery is known as the place to go for authentic West Coast First Nation art. What started as an economic development project for the Comox Indian Band has become a unique venue for showcasing and revitalizing First Nations culture in the Valley and throughout Vancouver Island. In 1995, price the Comox Indian Band—now the K’ómoks First Nation—was looking to develop business opportunities on its Courtenay reserve and create job opportunities for Band members. Then Band Manager Liz McLeod happened to meet Nancy Nightengale, drugs a member of the Squamish Nation and owner of Kahot-la-cha Art Gallery and Gift Shop in North Vancouver. McLeod, along with community member April Shopland, decided the Comox Band could take advantage of the local tourism industry with a similar gallery on the reserve. They set out to make it happen with guidance and support from Nightengale. When Sandra and Frank Spencer* said their wedding vows they knew that they wanted to spend the rest of their lives together. It was 1978 and the starry-eyed newlyweds had visions of owning a home and raising a family. They fantasized about growing old together, having grandchildren to spoil and the time—and financial resources—to be able to head south for a few weeks in the winter. For the first 20 years of their marriage everything fell into place according to plan. They bought a home and adopted three beautiful children. Frank had a good job that held promise of a great retirement. All of that changed in the late 1980s when their daughter, the eldest of the three children, started running with a bad crowd and exhibiting behavioral issues beyond their control. By the age of 16, she had run away from home, was addicted to drugs and then became pregnant. Emotion sweeps across Sandra Spencer’s face as she explains how it felt to get that phone call from the Ministry of Children and Family Development about 15 years ago. Considering that they had lost touch with their daughter for a few months, and were not even aware that she was pregnant, the phone call came as a complete shock. The caseworker explained the urgency of the situation. When it becomes necessary to remove a child from a living situation where they may be in danger of abuse or neglect they don’t mince words and waste time. Family members can’t sit down to review their budget, figure out sleeping arrangements and then decide if they can take charge of the minor. The immediate protection of the child is a priority. The Spencers were given two choices: One: Come to the mainland to immediately take custody of their infant grandchild, or two: Allow their first grandchild to enter the foster care system and possibly disappear from their lives forever. Despite the fact that they had two children under the age of 12 still at home, the Spencers knew in their hearts that they really had no choice but to accept this responsibility. They drove to the mainland and welcomed the newest addition to their family. Sadly, in addition to drug addictions, their daughter had been diagnosed with mental illness. Her addictions and illness rendered her incapable of making good decisions. She would give birth to two more children over the next seven years. Eventually all three children would come to live with Grandma and Grandpa Spencer full-time. Now in their early 60s, the Spencers find themselves living a scenario that never would have imagined. There is no hope that Frank can retire any time soon. While they are still helping their youngest son through college, they also have three grandchildren under the age of 15 living with them. So, instead of gearing up for retirement, they are shuttling kids to various sports practices and birthday parties. They are getting up at night to comfort and console sick children. To add to the challenge, the children have all been diagnosed with various health problems, such as Attention Deficit Hyperactivity Disorder (ADHD), Tourette’s Syndrome, Fetal Alcohol Spectrum Disorder (FASD) and other mental and physical illnesses directly related to their mother’s addictions. It is a routine that leaves them both exhausted at the end of every day. And sadly, over time, it has also left them out of touch with other people their own age. From the outside looking in, the Spencer’s life may seem extraordinary but it is their reality. What is really alarming is that they are not alone. Grandparents raising grandchildren without support of the parents are part of a social phenomenon that has been described as an ‘underground network of childcare’. Sometimes it is the separation, divorce or death of the parents that result in grandma getting custody of the grandkids. It may be because a single parent is recovering from illness, is off at school or required to work away from home for long periods of time. Sadly, more often than not, it is a result of mental illness and/or substance abuse and addictions that result in child neglect. This is a societal problem that is affecting people from across Canada, from all socio-economic groups, all races and religions. Statistics Canada reports that in 2006 there were more than 65,000 grandparents raising some 40,000 grandchildren in Canada. Two-thirds of them are single women. 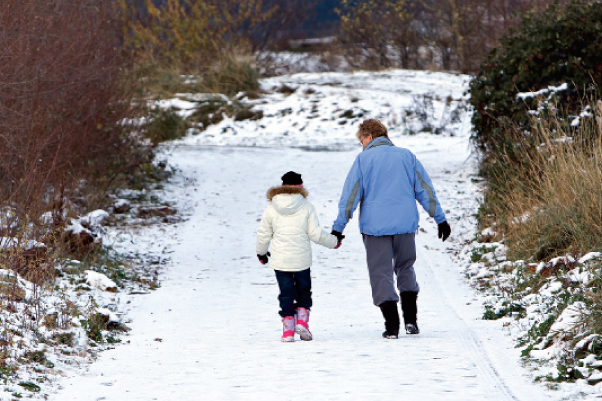 In British Columbia alone there were close to 10,000 grandparents raising 6,600 grandkids. Bear in mind that statistics do not include multi-generational families—where one or two grandparents live in the same home as the parents. These are homes where the parent(s) are absent and it is the grandparents who are tucking the kids into bed every night and attending parent/teacher conferences. Nor does it include situations where the grandkids are not legally registered with their grandparents as the legal guardians. It is interesting to note that if a grandparent, aunt, uncle or other extended family member secures legal custody of a child in this situation they receive very little financial support from the government. Foster families receive much more funding. About three years ago the impact of this new parenting paradigm shift started to become increasingly apparent to community support workers at the Comox Valley Child Development Association (CVCDA) and the Transition Society. Often, a home visit from a support worker or an appointment at the CVCDA office would be a grandparent’s only regular social contact. To respond to this growing need, in 2006 the two organizations partnered to create the Grandparents Raising Grandchildren Support Group. Meetings are held every Monday morning from 10:30-11:30 at the Child Development Association, 237 Third Street, Courtenay. There is no fee to attend, free childcare can be arranged if needed, and a referral is not required. About 15 to 20 people attend the meetings facilitated by Lee Bjarnason from the CVCDA and Diana Paige from the Transition Society. For Sandra Spencer and the other grandparents who attend the support group meetings, this has become a welcome addition to their weekly routines. Having somewhere and someone to share both their unique frustrations and triumphs with has been a blessing. Some weeks, she explains, the room is filled with laughter as they share funny stories. Other weeks it is filled with empathetic tears when they relay stories of sadness, frustration and disappointment. Someone usually brings cookies or snacks—occasionally a full lunch—to share with others. Sometimes they bring in guest speakers to address a specific topic but, most often, they just take time to talk and to listen in a non-judgmental and supportive environment where everyone feels respected and appreciated. Sandra explains that one of the biggest emotional struggles shared by members of the support group is that their role as grandparent is dramatically different than ‘normal’. In their unique situations, they have taken on the role of the disciplinarian. The parents— if they are in the picture at all—often flit in and out of the children’s lives. Everyone, she says, talks about how difficult it is to watch how excited the children get when a parent shows up, only to be disappointed when he or she then forgets to call on a birthday or isn’t heard from again for weeks. Usually, it is this kind of excitement—without the subsequent disappointment—that is reserved for Oma and Opa. Bjornson adds that coping with the challenges of raising grandchildren is often especially difficult for men. They are often not able to attend the Monday morning meetings or doctor/therapist appointments due to work commitments. It would be ideal, she says, if an evening support group could be set up to provide people who are still working full-time with a place to go for support. The barrier, of course, is lack of funding. While the Transition Society is grateful for the current funding provided by the BC Association for Charitable Gaming, they would love to find another source of funding that would allow them to have an evening support group. Despite the day-to-day challenges, Spencer says that there are many benefits of having grandparents raising grandchildren– beyond the obvious of keeping them out of an overburdened foster care system and the disruption of being placed in multiple care situations. On the up side is the companionship and unconditional love that a child provides to the senior, as well as the satisfaction in knowing that your grandchildren are living safe and happy lives. “Research—and common sense—tells us that children need the continuity and security of having ‘roots’ and family traditions,” says Bjarnason. “They need to hear stories about and see pictures of their parent(s) and they need to feel safe, loved and cared for. Although they may feel rejected by their parent(s), they do not feel rejected by the entire family and that is really, really important. *Note: Names and some details of the family featured in this story have been changed to protect their privacy. have just finished reading your letter[terri perrin dec 2010] it made me feel a lot better. we thought we were the only ones going through this problem hope to read more like this.